You can't help but crave for hearty soups in the fall and winter seasons. This recipe is actually a classic Filipino soup made with mung beans. Mung beans are small, lentil-like split beans. Mung beans are commonly used in Chinese cuisine, where they are called l? dòu (? ?, literally "green bean"), as well as in Burma, Thailand, Japan, Korea, Philippines, Pakistan, India, and Southeast Asia. In Vietnam, they are called ? ?u xanh (again, literally "green bean"). They are generally eaten either whole (with or without skins) or as bean sprouts, or used to make the dessert "green bean soup". The starch of mung beans is also extracted from them to make jellies and "transparent/cellophane" noodles. Many people make the common mistake of thinking that the transparent wrapping of Vietnamese spring rolls is made from mung bean flour. However, it is actually made of rice flour, tapioca starch, water, and salt. 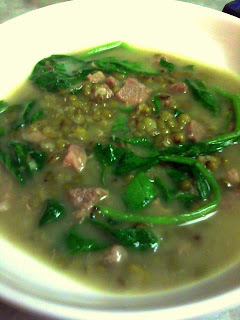 In Filipino cuisine, meat is sauteed with garlic, onions, and bay leaves, then mung beans are added and cooked. Mung batter is used to make crepes named pesarattu in Andhra Pradesh, India. (WIKIPEDIA) This soup is definitely hearty, delicious, easy and fantastic over fluffy Jasmine rice. In a large stock pot saute the onions, garlic, and bay leaves until the onions are soft. Add the diced porkchops or pork belly and saute with about 1 TBL of salt and 1 tsp of pepper. After the pork chops have sauteed for about 5 minutes, add all the mung beans and cover with chicken stock and soy sauce, and bring to a boil. Once it has boiled, bring down the heat to about medium to medium-low and simmer for about 30-45 minutes, or until the mung beans are soft and pork is cooked and tender. Add the fresh spinach and cook for another 5-6 minutes.